-Candy Grams – For only $1/gram you can help brighten someone’s Valentine’s Day. Tuesday is the last day to turn in your order. Grams will be distributed on Valentine’s Day. -Mary’s Dine and Donate – 15% of your purchase on Wednesday, February 13 will go to support our 6th graders (flier is in your Friday folder and this digital notice). 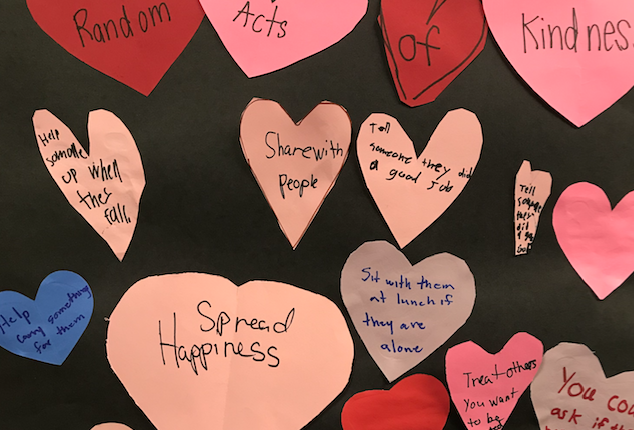 Our focus this month is on random acts of kindness. We talked about this during our Monday assembly and used our TRIBES time to do some random acts of kindness. Encourage your child to think of ways they can fill someone else’s bucket this month. We are starting to gear up for the 19-20 school year. Intent to continue forms went home last week in your child’s Friday folder (it is also attached here). Our current Dunham students have the priority to continue with Dunham next year. Please let us know your plans for 19-20 by completing the form. Thank you to the many of you who have already shared your plans to continue at Dunham next year! Next Wednesday, February 13 is a Dunham Spirit Day – crazy sock day. We look forward to seeing some wild socks.